Friday Fun - You can get PAID for doing that?! Well, friends, another glorious weekend is in sight. Before we head off to enjoy the last of Spring, let's wrap up some loose ends from the last couple of weeks. (At least according to them...if you believe that, be sure to "like" the Facebook and Privacy Fan Page.) We're still waiting for some indication that they understand it's wrong to impersonate users to suggest friends - until that happens, be sure to "Remove" any contacts you've imported to FB Friend Finder. For background on this see Lesson Learned the Hard Way: Do NOT Upload your e-Mail Contacts to Facebook, and So, what's up with Facebook, anyway? This week, we discussed The Online Job Search. Mashable also has a great post, 3 Ways to Ace Your Job Interview with Social Media. Check it out. Also, you will need to provide an e-mail address for any job application you submit online or electronically. It's important that your e-mail address reflect you in a professional manner. Cutsie nicknames are not ideal - it's better to use some version of your name, if at all possible. 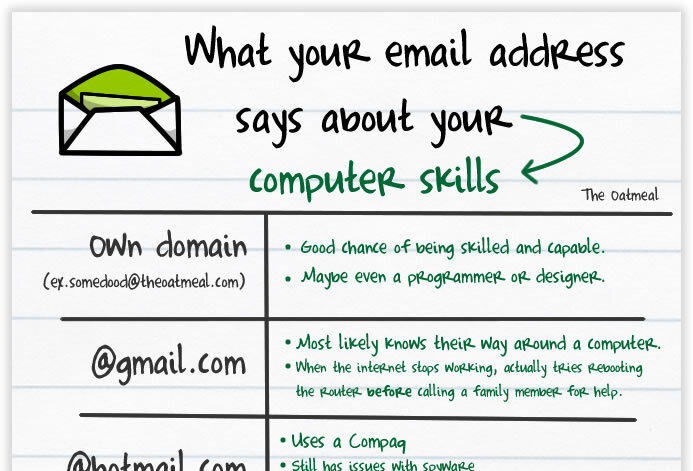 The Oatmeal has some additional (mostly tongue-in-cheek) information about what your e-mail address says about you. (Apologies to all AOL users.) Click HERE to read the list. You can get PAID for doing that?! Are you addicted to Facebook, or Twitter, or social networking in general? Did you know you can now make a career out of it? That's right. SimplyHired.com has a whole list of social networking jobs available right now. Also see SocialNetworkingJobs.org, and Social Media Jobs on Ning. You can also get paid to blog. If you enjoy doing what it takes to get profiles and posts to the front page of the search engines ("Search Engine Optimization," or "SEO"), you can get paid to do that, too. There are also jobs available in online profile management. Keep in mind that with a few exceptions, this work is generally freelance, and part-time. Jennifer Pointer (e-mail) is a trainer and tech writer in Tulsa, OK. She promotes a simple, a low-tech approach to effective online profile management, search engine optimization and social networking. Her weakness is the mocha frappuccino.